You hear talk about games that are "not for you." You try to keep an open mind. You play Gears of War; you play de Blob. You enjoy both. But here, at last, a game that's not for me. TV SuperStars is a loud gameshow game that has all the glitz of the British TV contests I have no interest in watching, plus (minus) none of the star power I believe those shows have. The game is from Sony Cambridge and puts one or more players in the role of contestant on a gameshow hosted by a cast of toothy, grinning eccentrics. You play the game with a PlayStation Move wand in hand. The PlayStation Eye camera, which is required for the Move, is used, impressively, to snap photos of your face that can be applied to your avatar. You get that NBA Jam effect of photo head on video game body. The game itself, based on the demo I had access to, brings the player into a variety of gameshows. A friend and I tried the two shows available in the demo. The first was a fashion and music gameshow called Frockstar that let us each have a turn of dancing our avatar down a fashion runway. The dancing consisted of having to wave, zigzag and otherwise use the Move wand to follow patterns sketched on the screen. The problem with this one was that the music wasn't catchy and the movement patterns weren't interesting. Worst of all, there was no controller feedback to help show the player when they were matching patterns correctly. You either saw the pattern being colored in on the screen or you didn't. Given that the Move can vibrate and that its orb can change colors, that seems like a missed opportunity to help players recognize whether they are in sync with the game. The second gameshow in the demo, Let's Get Physical, played better. It had me and my friend taking turns launching our avatars out of a cannon and into targets. The challenge here was to get the avatar's body rotated while in mid-flight with tilts of the Move in order to have them match the silhouette of their figure painted on the target toward which they were shot. The posture-matching is a three-dimensional version of the same mechanic in Wii Play. This cannon bit, which was the most fun of the demo's activities, was followed by a challenge to shake the Move in order to get an avatar to run in place on top of a giant wheel. The player has to press the Move's main button to make the avatar jump and avoid swinging hazards. 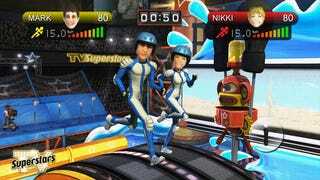 The gameplay in TV SuperStars seems to be shallow, though, even in the demo, it is garnished with an elaborate faux gameshow set. Clearly, the game is being targeted at people who would enjoy seeing themselves on what looks like an exaggerated version of American Idol, American Gladiators or those wildly popular British talent shows. The demo isn't final, and it contains multiple notices that more features and modes will be added, but the first impression here is not a good one, not for me. Perhaps it's more your thing?